The increase of comfort requirements together with the need to control energy usage provides special importance to buildings’ thermal performance and energy efficiency. Buildings’ energy performance is strongly influenced by the thermal behavior of facades. Therefore, enhancing the thermal insulation of exterior walls or walls connected to not heated spaces lead to an increase in thermal comfort and reduced energy consumption. 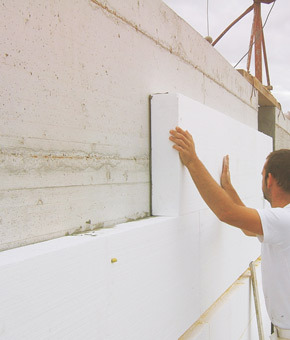 RenoBuild has an extensive experience in the application of ETICS systems (External Thermal Insulation Composite System), having performed thousands of square meters of facades, both in new and existing constructions. ETICS systems from the reference brands STO and Fassa Bortolo are at your disposal. These systems stand out due to the possibility of finishings without joints, impermeability to heavy rains and good water vapour permeability. Wide range of finishing solutions. 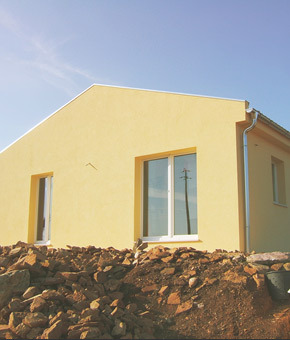 In some cases, external thermal insulation is prevented by the existing constraints of the building. In such situations, we may choose various internal insulation solutions which will improve the thermal behavior. In these cases we may choose from several internal insulation solutions that allow improving the thermal performance, combining the aforementioned insulating materials with gypsum board plates. Some of the thermal insulation solutions also allow improving the acoustic performance of the intervened space. The roof is the area that is subject to greater temperature variations. Therefore, thermal insulation of the roof is a priority measure when improving thermal comfort and energy efficiency of a dwelling. 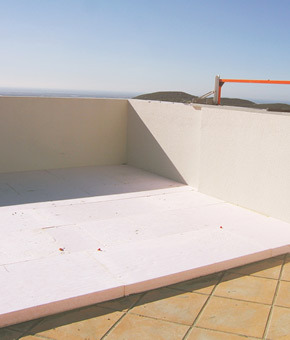 RenoBuild has an extensive experience in the application of various solutions of roofing insulation, either in horizontal roofs (inverted roofs, terraces) as on sloped roofs (mat slab, insulation of sloped sides). Expanded Insulation Corkboards are made of a totally natural and renewable raw material – cork, extraction of which from the tree is part of its life cycle. Among the advantages of using cork note the following: 100% natural product; Very low embodied energy; Thermal Insulation, Acoustic and anti-vibration simultaneously; High dimensional stability; Almost unlimited durability, keeping technical features; Promotes thermal lag; Permeable to water vapour; In case of fire it does not release toxic gases; Does not react to chemical agents; not attackable by rodents; 100% Recyclable and Reusable in other applications. Thermal Insulation: Ability of the material to retain the passage of heat / cold. The Expanded Insulation Corkboard has the characteristic of low thermal conductivity combined with a slow and gradual release of this heat / cold to the interior / exterior (high thermal inertia). Anti-vibration Insulation: Ability of a material when subjected to loads have a natural tendency to recovery (resilience) to help prevent the spread of vibration over a given surface to be transmitted to the contiguous space. Acoustic Insulation: Ability of a material to absorb the sound waves transforming them into energy and releasing only a remnant. This difference between the absorption capacity and the initial value of the noise results in an acoustic insulation. The Expanded Insulation Corkboard can be used as material for the correction of acoustic environments and when in a constructive solution, as an important acoustic insulation. Aware of the importance of sustainable construction practices, RenoBuild offers the possibility of thermal and acoustic insulation of your home with cork (Roofs, Floors, Ceilings and Walls).